The great illusionist Harry Houdini will be appearing on a TV near you in a new History network miniseries starring Adrien Brody. According to a press release, the network announced today that is has green-lighted production of a four-hour scripted miniseries to start production this fall. Titled simply Houdini, it will star Academy Award winner Adrien Brody (The Piano, Predators) as Harry aka Erik Weisz with Kristen Connolly (House of Cards, The Cabin in the Woods) as wife Bess. The miniseries will be co-produced by Lionsgate and A+E Studios, and will focus on Houdini's rise from poverty to fame. The movie will also follow the illusionist's engagement with spiritualists and, according to the release, his encounters with the greatest names of the era, from U.S. presidents to Sir Arthur Conan Doyle and Grigori Rasputin. "The Great Harry Houdini is a fascinating man in history and I have no doubt that Adrien Brody will bring the magician’s riveting story to life for our audience," said Dirk Hoogstra, EVP and General Manager, History. Said Brody, "Since my childhood, when I dreamed of being a great magician, Harry Houdini has been one of my heroes ... His bravery and obsessive determination still fascinate me. 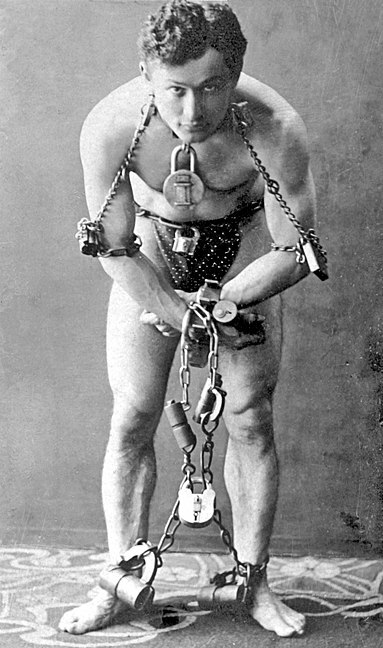 "Houdini mastered the art of escape – not only from physical chains, but from poverty and the social constraints of a humble immigrant origin. His life story appeals to the universal longing for acceptance with which we all can identify. To portray him is beyond an honor." The release adds that Gerald W. Abrams (Nuremberg, Family of Spies) and Andras Hamori (Sunshine) will serve as executive producers, with Academy Award nominated Nicholas Meyer (The Seven-Per-Cent Solution) writing and Academy Award nominated director Uli Edel (The Baader Meinhof Complex, Hotel Adlon) helming. How does the project sound to you? Think Brody has the chops to play Houdini? Does this sound like the Houdini movie you've been waiting for?